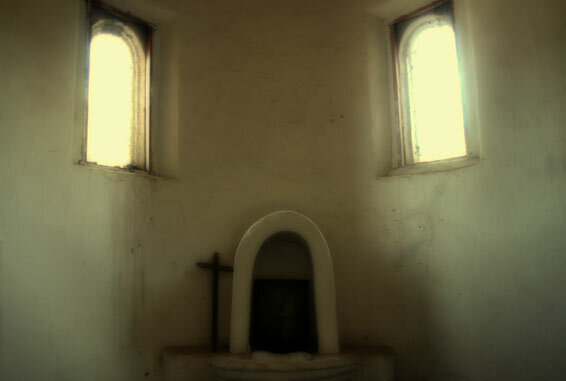 The Inside of the Lost Mission of Satevo. See the previous entry for more on Satevo. I had the privilege of touring with a Tarahumaran guide. The Tarahumara, as a people, are fascinating. They are the most resilient and self-sufficient people I’ve met. Their sandals are made from the rubber of old tires. They use the sandals to race in world renowned races. Tarahumara men, because of the elevation, the heat, the extreme length of their travels – are able to run hundreds of miles without a stop. They are some of the world’s best natural marathon runners. And I was hiking with one! Awaking at six, with a liter of water in hand and some granola bars in the camera bag, I walked out of the streets with Modesto. He’s a short and friendly man with a tinge of gray hair. In fact, he looks like an extremely well-tanned Mel Gibson. Modesto knows the Native Tarahumaran tongue, and I was lucky enough to hear him speak it when he ran into a friend on the trail. We walked along the crystal clear waters of Batopilas River. It was a gorgeous, but hot, hike. All along the trail, I adamantly tried to strike up conversation with Modesto. Naturally, my Spanish would serve its purpose, I thought. But most Tarahumara don’t know Spanish, or very little, if they do. And, I’m sure understanding my mediocre Spanish is about as difficult as me trying to understand his Native Tarahumara dialect. On the trail, there were abanoned buildings and the occasional Mexican cowboy (make no mistake: These are real cowboys – the types of cowboys that existed even before pilgrims landed in the U.S.). There was a small school in the middle of nowhere, and it seemed to be empty. I probably saw about fifty burros on the way. Rio Batopilas is a beautiful river that somehow manages to remain cool in 95-degree weather. halfway along the trail my water was down to 1/4 of a liter. 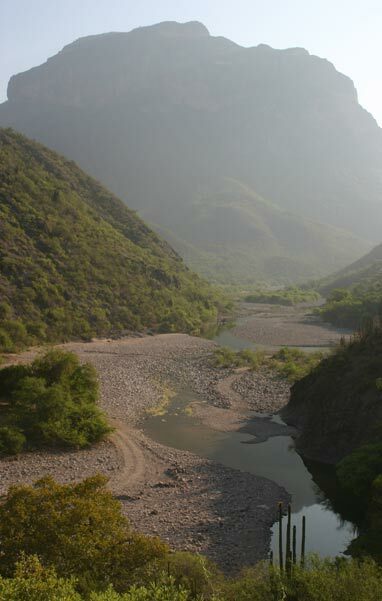 It was empty by the time we reached Cerro Colorado. The outside temperature had topped 100 degrees Fahrenheit. The tiny pueblo of Cerro Colorado (“cerro” means hill in Spanish) is comprised of one truck, and about ten houses. It is a derelict mining boomtown. 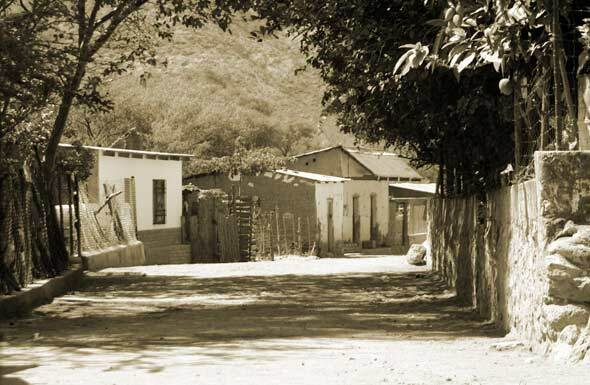 Three-hundred years ago, the houses of Cerro Colorado probably contained Spanish criollos who supervised the back-breaking work of mining silver. Undoubtedly, Modesto’s ancestors were probably slaves in the silver mines at one time. We sat down on a bench before returning to Batopilas (which seemed like a metropolis compared to this town) and Modesto chatted it up with a guy sharpening his knife on a rock. An old woman, who had to be at least 95, and had likely lived deep in these canyons for the whole duration, caned her way to the gate to see who was sitting on the bench. Apparently, a pale-faced gringo is the last thing she expected to see! I gave Modesto a granola bar; he couldn’t figure out how to open it, so I gave it a good tear. I hadn’t realized that we walked 10 kilometers by this time. That would mean the return trip would be a seven mile trek in 100-degree weather (and shade was nowhere to be seen). Upon returning, the only thing in my sights was the river full of water and the aquedect next to me (constructed for the mines in the 1700s, but still in full use!) My clean water was gone! I couldn’t drink for the seven mile trip back. Modesto told me earlier that the water in the aqueduct is very “sucio” (dirty), so I refrained. But, to my surprise, less than a mile out of Batopilas, he dipped his hands into the aqueduct and began drinking prodigiously. I’m sure his stomach was fully aware of the microbes that existed in the water – his DNA contains a natural resistance to burro dung, perhaps? Modesto laughed when I saw him drinking. Laughing at me was a normal occurrence for Modesto, so I shrugged it off and smiled. Upon return, Monse fixed me water with lime juice from the trees in her garden. Monse is an avid gardener and leads a gardening group in Batopilas. The lime water was the most satiating substance I’ve imbibed in my life. After about three litres of this nectar of the gods, I crashed on the hammock. It was a state of half-sleep and half-awareness, as the weather was unbearably hot, but somehow the hammock and a leak in one of her garden irrigators made everything better. I am now recouped. just took my bath in the river (there are no baths in the bathroom, ironically; just a toilet). This is a paradise – if only it was a bit cooler, everything would be perfect. This entry was posted on Thursday, July 10th, 2008 at 7:19 pm	and is filed under Built Environment, Geotagged, Physical Geography, Special Series. You can follow any responses to this entry through the RSS 2.0 feed. You can skip to the end and leave a response. Pinging is currently not allowed. Glad ya had a nice time…..:] Saludos a todos…. I desire to do this hike in March, on my next trip to Batopilas. Do you simply follow the river upstream the entire hike once leaving Batopilas? Are there any trails or is it best to walk along the river? Any advice you have is appreciated. The hike is relatively easy to find. You basically go to the north side of town and follow the aqueduct. There is an adjoining trail that winds along the rive (first on the left, then it crosses the river and follows on the right). I think it crosses once or twice. It’s always good to have a guide, though. Ask Snra Monse who owns one of the few hotels in Batopilas. She can hook you up with a Taramuhara guide for about 150 – 200 pesos (everyone there also prefers American money). Great information and history. I agree with Greg that its probably better to get a guide!